Mon. 16. 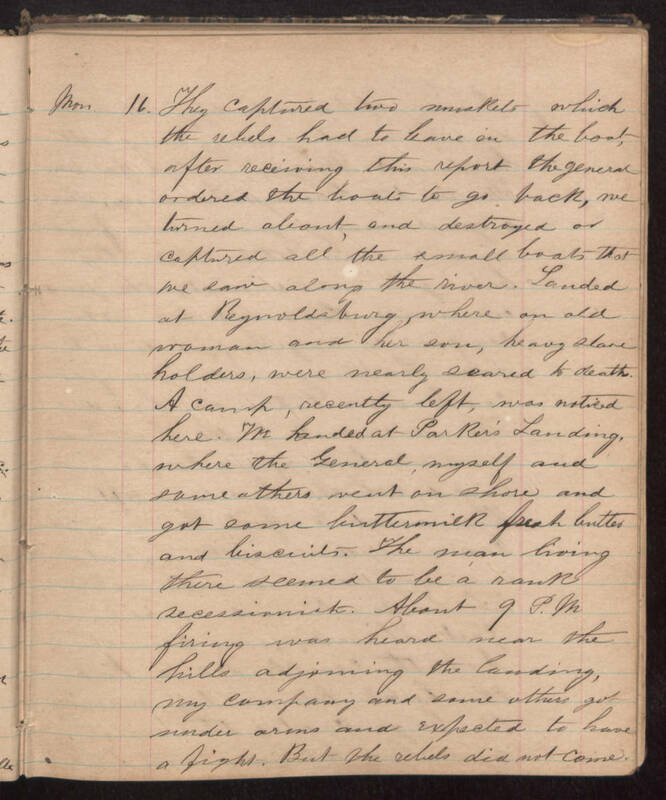 They captured two muskets which the rebels had to leave on the boat, after receiving this report the general ordered the boats to go back, we turned about and destroyed or captured all the small boats that we saw along the river. Landed at Reynoldsburg, where an old woman and her son, heavy slave holders, were nearly scared to death. A camp, recently left, was noticed here. We landed at Parker’s Landing where the General, myself and some others went on shore and got some buttermilk fresh butter and biscuits. The man living there seemed to be a rank secessionist. About 9 P. M. firing was heard near the hills adjoining the landing, my company and some others got under arms and expected to have a fight. But the rebels did not come.